The Atrahasis Epic, named after its human hero, is a story from Mesopotamia that includes both a creation and a flood account. It was composed as early as the nineteenth century B.C.E. In its cosmology, heaven is ruled by the god Anu, earth by Enlil, and the freshwater ocean by Enki. 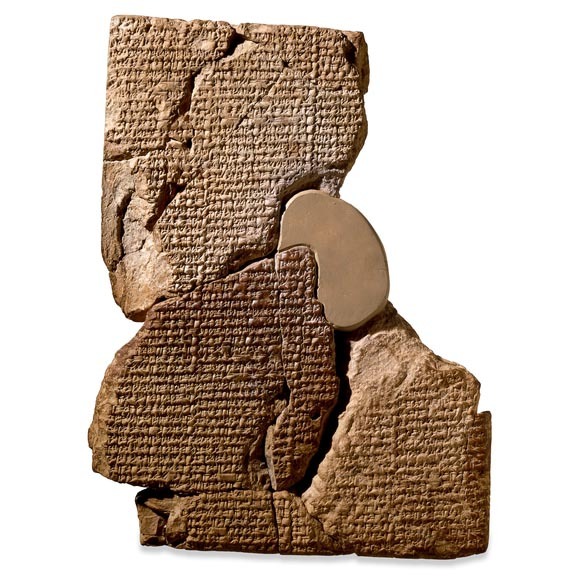 Enlil set the lesser gods to work farming the land and maintaining the irrigation canals. After forty years they refused to work any longer. Enki, also the wise counselor to the gods, proposed that humans be created to assume the work. The goddess Mami made humans by shaping clay mixed with saliva and the blood of the under-god We, who was slain for this purpose. The human population worked and grew, but so did the noise they made. Because it disturbed Enlil’s sleep, he decided to destroy the human race. First he sent a plague, then a famine followed by a drought, and lastly a flood. Each time Enki forewarned Atrahasis, enabling him to survive the disaster. He gave Atrahasis seven days warning of the flood and told him to build a boat. Atrahasis loaded it with animals and birds and his own possessions. Though the rest of humanity perished, he survived. When the gods realized they had destroyed the labor force that had produced food for their offerings they regretted their actions. The story breaks off at this point, so we learn nothing of the boat’s landing or the later Atrahasis. The account has similarities to the Primeval History, including the creation of humans out of clay (see Genesis 2:7), a flood, and boat-building hero. For the text of the Atrahasis Epic see Pritchard (1969: 104-106). For a detailed study see W. G. Lambert and A. R. Millard, Atrahasis (Oxford: Clarendon Lambert, 1969). When the Gods did the work they grew weary and decided to create human beings. This later Akkadian version of the flood story and the creation of humanity and fits between the Sumerian version and the Babylonian version in the Epic of Gilgamesh. The following excerpt is taken from Myths From Mesopotamia: Gilgamesh, The Flood, and Others, translated by Stephanie Dalley. It is related here for educational purposes only. Cast the lots; the gods made the division. And Ellil took the earth for his people. Was assigned to far-sighted Enki. Made the Igigi bear the workload. Had to clear channels, the lifelines of the land. And then dug out the Euphrates. They were counting the years of loads. Hard work, night and day. And get him to relieve us of our hard work! The counselor of the gods, the warrior from his dwelling. The counselor of the gods, the warrior, from his dwelling. Let us mix fight with battle! Their loads for the fire-god. The house was surrounded, the god had not realized. Ekur was surrounded, Ellil had not realized. He held the lock and watched the gate. They listened to the noise of the Igigi. A rabble is running around your door! Ellil had weapons brought to his dwelling. Take up your weapons and stand in front of me. Took up his weapons and stood in front of Ellil. ‘O my lord, your face is sallow as Tamarisk! Why do you fear your own sons? ‘O Ellil, you face is sallow as Tamarisk! Have Enki fetched into your presence. Enki, king of the Apsu attended. The great Anunnaki were present. Ellil got up and the case was put. Is it against me that they have risen? What did I see with my own eyes? A rabble was running around my door! Who have surrounded your door. Take up your weapons and stand before me! Who is in charge of the rabble? Who is in charge of the fighting? He bowed, then stood and told the message. “Who is in charge of the rabble? Every single one of us declared war! We have put a stop to the digging. The load is excessive, it is killing us! Our work is too hard, the trouble too much! Ellil listened to that speech. What are we complaining of? Their work was indeed too hard, their trouble was too much. Every day the Earth resounded. The warning signal was loud enough, we kept hearing the noise. Call up one and cast him for destruction! “Who is in charge of the rabble? Who will be in charge of battle? Which god started the war? “Who is in charge of the rabble? Who is in charge of the fighting? Which god started the war?A rabble was running around Ellil’s door! Why are we blaming them? Their work was too hard, their trouble was too much. Let man bear the load of the gods! And let them bear the load of the gods! You are the womb-goddess, to be the creator of Mankind! Create a mortal, that he may bear the yoke! Let him bear the load of the gods! I shall make a purification by washing. Then one god should be slaughtered. And the gods can be purified by immersion. With his flesh and blood. Will be mixed together in clay. And let the ghost exist so as not to forget the slain god. He made a purification by washing. They slaughtered in their assembly. They heard the drumbeat forever after. and she proclaimed it as his living sign. The ghost existed so as not to forget the slain god. She called up the Anunnaki, the great gods. The work that you ordered of me. You have slaughtered a god together with his intelligence. I have imposed your load on man. You have bestowed noise on mankind. I have undone the fetter and granted freedom. But now your name shall be Mistress of All Gods. Went into the room of fate. Between them she put down a mud brick. Womb goddesses, seven and seven. For the womb goddess is creator of fate. …them two by two in her presence. The mud brick shall be put down for seven days. Belet-ili, wise Mami shall be honored. The mother of the baby shall sever herself. On a young man’s cheek. A wife and her husband choose each other. Called up the Tenth month as the term of fates. She slipped in a staff and opened the womb. Her face was glad and joyful. Put on her belt, said a blessing. I myself created it, my hands made it. he midwife shall rejoice in the house of the qadistu-priestess. The mud brick shall be put down for nine days. Nintu the womb goddess shall be honored. Lay down the linen cloth. A wife and her husband shall choose each other. And they shall call Inanna (Ishtar) “Ishhara”. To feed people and sustain the gods. 600 years, less than 600, passed,???? And the country was as noisy as a bellowing bull. Ellil had to listen to their noise. Whose ear was open to his god Enki. And his god would speak with him. How long will the gods make us suffer? Will they make us suffer illness forever? Call the elders, the senior men! But search out the door of Namtara. Bring as baked loaf into his presence. And wipe away his hand. Gathered the elders to his door. I have called the elders, the senior men! May the flour offerings reach him. They built a temple for Namtara in the city. They made a loud noise in the land. The flour offerings reached him. And he was shamed by the presents. And wiped away his hand. The gods went back to their regular offerings. This entry was posted in Ancient Texts and tagged Anunnaki, Atrahasis, Epic of Creation, Flood Myth, Noah, Sumer on February 7, 2015 by ZSI.